On Wednesday I popped into a fruit store that had cheap bananas advertised on a sign outside. When I got there, I saw something even better. 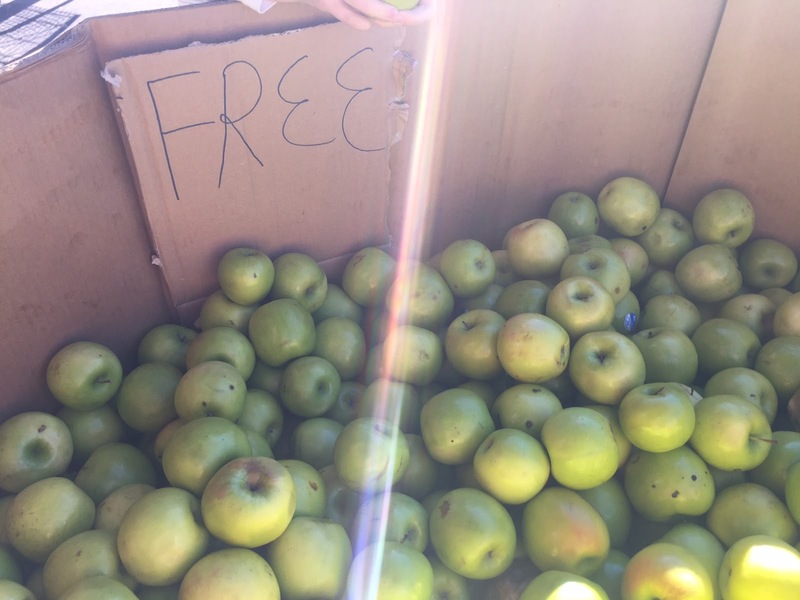 Free apples! I think the light streak on the photo above really captures the glory that was the moment when I spotted that FREE sign. I asked for a box from the storekeeper and filled it with these beauties. My box of free apples. And then I spent the rest of the day peeling, slicing, dicing and preserving apples at my kitchen table. First up I got the dehydrator cranking, since that takes the longest to do its thing. I ran it overnight and L has been snacking on dry apple slices ever since. It's been a great lunchbox filler for her too. 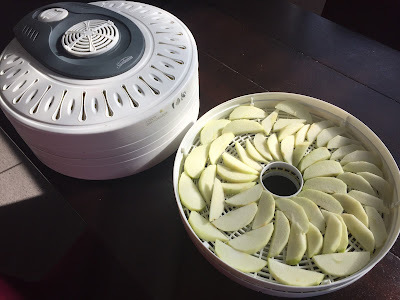 Apple slices ready for the dehydrator. I also cooked up many pots' worth of stewed apples in a dash of water, coconut oil, vanilla, cinnamon, cloves, nutmeg and brown sugar. I filled whatever jars and containers I could find with the stewed apples and placed them in the freezer to use later. I'm picturing lots of apple pies in our future. 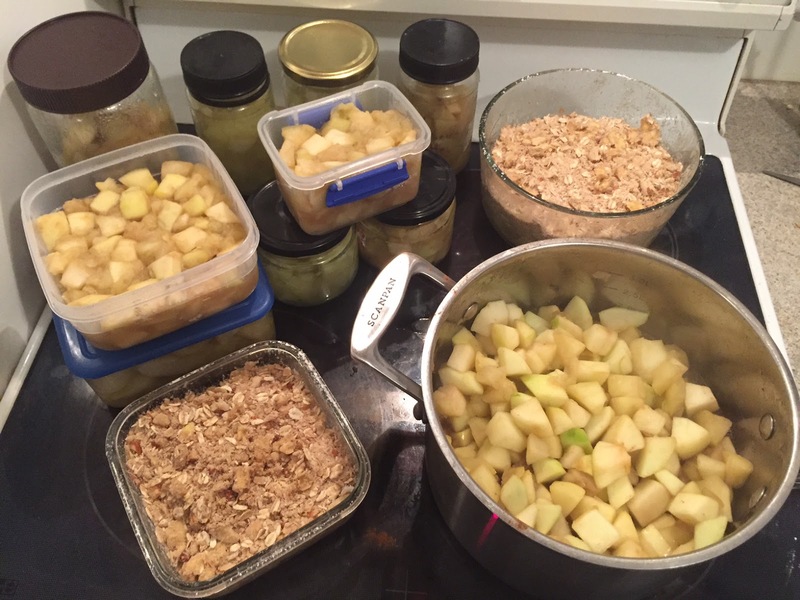 With some of the stewed apples, I assembled apple crumbles in oven-safe glass containers that have lids so I could freeze them and bring them out to cook for an instant dessert when I want to. Stewed fruit and apple crumble. I was messaging with my friend, Angela, as I worked and she told me she loves drinking the liquid that the apples get cooked in as an apple tea. I poured off a cup of the liquid and, oh my! It was the best thing I've ever tasted. Picture yourself drinking a hot apple pie, and that's exactly what it tasted like. So, so good. I think it helped knock my cold for six too, because I woke up the next day feeling much better. 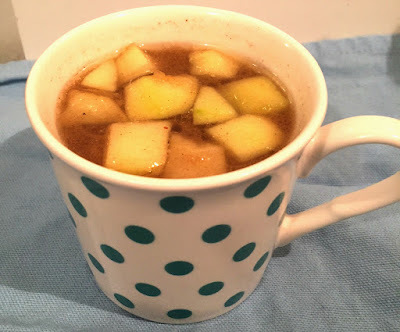 Another good idea Angela gave me was to save the apple peels in the freezer and pull them out to add to smoothies for extra fibre and nutrition. I didn't do it this time, just composted mine since I hadn't washed the apple skins, but thought it was a great, frugal idea for a future apple marathon. I wouldn't normally make apple sauce with apples, but since Angela told me it was her family's favourite way to eat cooked apples and she hadn't steered me wrong so far, I thought I'd give it a try with the last pot of stewed apples. 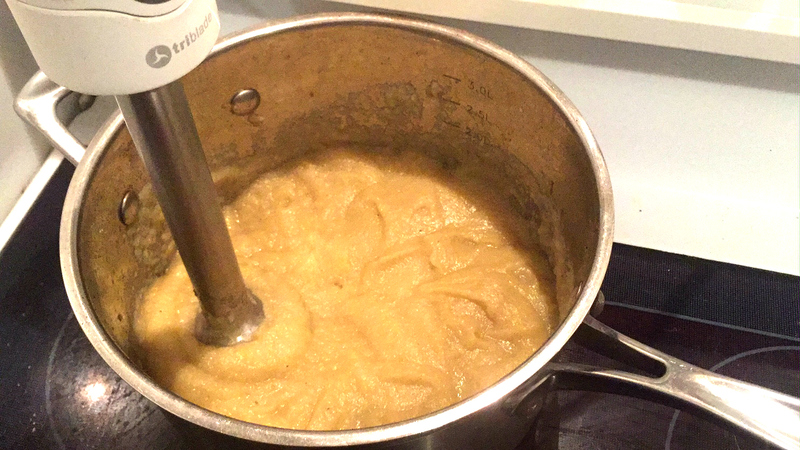 I blended them with my immersion blender directly in the pot and froze the resulting apple sauce in ziploc bags in the freezer. 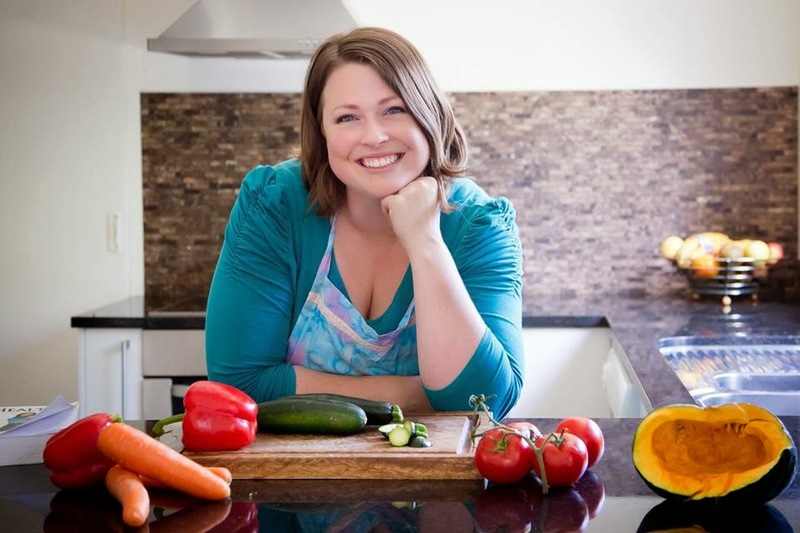 I also put a jar of the apple sauce into the fridge and have been using it as a dip at mealtimes for carrots - another excellent idea I got from Angela. I'm also planning to swirl it with my yoghurt or porridge the next time I have either. And finally, with the last couple of apples I made an apple cake, using a Destitute Gourmet recipe that has a lovely crumble topping. The girls had the apple cake as a treat in their school lunchboxes on Friday, and I've been enjoying the odd slice myself. All in all, not a bad day's work. 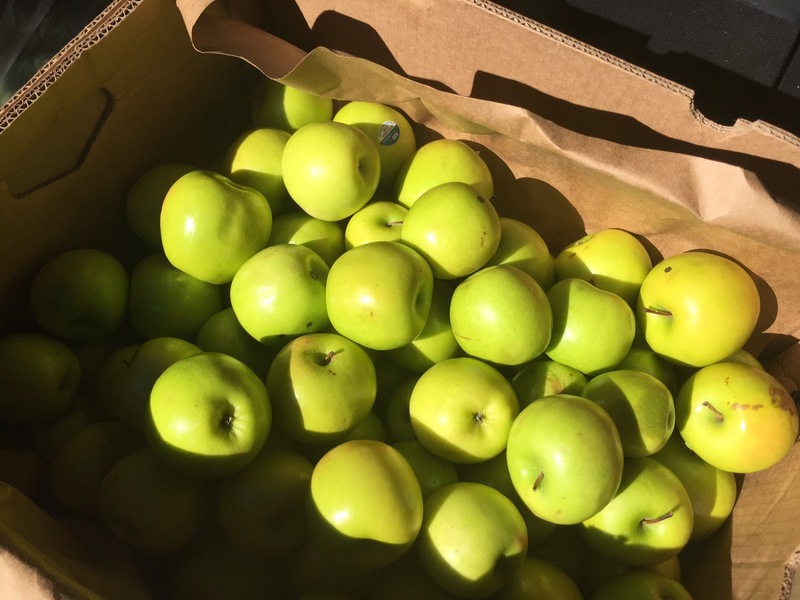 I'm so grateful for the provision of these apples. Free fruit seems so much more exciting than bought fruit for some reason. Wow! Apple marathon! Well done you must be worn out! I was a bit spent after all that. 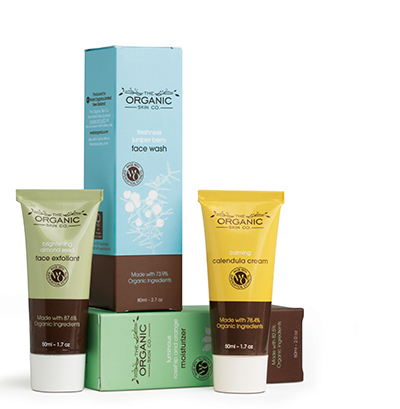 I had a nice soak in the bath to unwind.